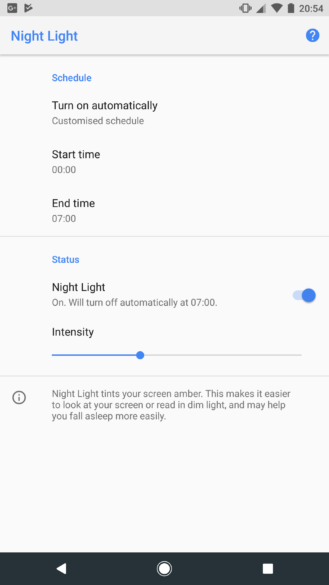 Night Light made its formal debut on Android 7.1 Nougat not long ago, but that doesn't mean that it can't be improved upon. The second Android O developer preview has added a slider that allows you to control the intensity of Night Light, just in case you found the default to be too yellow. This is a rough explanation, but Night Light exists to reduce the amount of blue light emitted by your screen, which makes your brain think it's time to go to sleep. The slide is pretty self-explanatory, really; it just enables you to adjust how much yellower your screen gets when you toggle Night Light. It's a simple, yet handy feature. Keep in mind that Night Light still requires specific drivers that Nexus devices don't support, so those of you with 5Xes and 6Ps are still out of luck in this arena. But to those of you who own Pixels, slide away!